This paper focuses on community-based initiatives in socio-ecological production landscapes and seascapes (SEPLS) that relate to the monitoring of the status of, and changes in, ecosystems and related community health and well-being. In different regions of the world, indigenous peoples and local communities have developed or are developing their own monitoring approaches, based on a mix of traditional knowledge and new or innovative technologies and tools. These approaches are referred to as “community-based monitoring and information systems (CBMIS)”. While generally the first aim of data collection and monitoring is to strengthen the local knowledge base for territorial resource management and community development, CBMIS also increasingly contributes to global assessments related to biodiversity, climate change and development. CBMIS initiatives are quickly gaining the acknowledgement, recognition and support of international policy-makers, conservation and development agencies, and the academe. Key processes that already use and acknowledge CBMIS contributions are the Convention on Biological Diversity (CBD) and the Intergovernmental Platform on Biodiversity and Ecosystem Services (IPBES). CBMIS is particularly relevant to SEPLS because of the interaction between humans (indigenous peoples and local communities) and their environment and natural resources, and focuses on SEPLS key issues such as species used as food and medicine, documenting and monitoring the effects of land and resource-use practices, and monitoring of customary rules and norms. This paper focuses on community-based initiatives in socioecological production landscapes and seascapes (SEPLS) that relate to the monitoring of the status of, and changes in, ecosystems and related community health and well-being. One key process that has already acknowledged CBMIS contributions is the Convention on Biological Diversity (CBD). The fourth edition of its flagship publication, the Global Biodiversity Outlook (GBO-4) [See http://www.cbd.int/gbo4/], released in 2014, included a number of examples based on CBMIS. Recent Decisions adopted by the Twelfth Meeting of the Conference of the Parties to the CBD (COP-12) also stressed the importance of CBMIS in monitoring the implementation of the 2011-2020 Strategic Plan for Biodiversity and the achievement of the Aichi Biodiversity Targets (see results section). land use and tenure issues and external pressures on SEPLS in indigenous territories, including reporting and monitoring of degradation, illegal activities, pollution, etc. Generally the primary aim of data collection and monitoring is to strengthen the local knowledge base for territorial resource management and community development. However, the contribution of case studies and complementary data for monitoring of progress towards international targets and agreements is an important added value of CBMIS initiatives, which is gaining increasing acknowledgement and support from international policymakers, conservation and development agencies, and the academe. With CBMIS’s local (micro) level focus, and the profound knowledge and connection to the areas being monitored, indigenous peoples and local communities can make important contributions to national and global assessments and monitoring initiatives that are carried out at larger scale, especially in areas where other organizations do not have the capacity to collect detailed data. CBMIS is very diverse and can range from technically simple and basic to technologically advanced and sophisticated. Some of the methodologies and processes that have been presented so far in the network include community mapping, resource inventories, eco/agri-calendars, biodiversity registers and other community-based biodiversity monitoring (CBBM) approaches. The tools being used include questionnaires and forms (hardcopies), cameras, GPS, video, smartphones and tablets, community radio, measurement kits (for water and soil samples and for carbon storage calculations), and people’s oral testimonies. Many communities work with selected software to link their data to maps and computer databases. There are currently many free or cheap (open-access) web-based tools available that communities can consider using (e.g. EpiCollect, Sapelli, ODK, GIS Cloud, OpenStreetMap) (Ferrari et al. 2015), depending on their priorities and needs. Several technical global workshops on CBMIS have been organized since 2013 to exchange information on tools and methodologies. These have been much appreciated by the practitioners involved and the process is expected to continue in order to consolidate approaches, develop a toolkit that communities can use and adapt, and to develop ways to aggregate data from the ground up. Community-based mapping has been recognized as a very important tool for documenting and monitoring trends in land use. Participatory videoing is another initiative some of the communities have taken (for instance in Cameroon) to document land use changes. The following are a few selected examples of CBMIS. The Ngati Hine people of Aotearoa, New Zealand, headed by the Maori community-based organization Nga Tirairaka o Ngati Hine, are facing environmental problems affecting their territory, including intensive farming with chemicals, deforestation, and change in land use from hunting and gardening to agriculture and exotic forestry. To address these problems, they decided to establish a monitoring framework to keep track of resource use and changes in their territory. The monitoring framework is not merely based on ecosystems, but on people’s cultural and spiritual identity, particularly the realms of gods and goddesses that relate to biodiversity. These include: water; earth, soil, minerals; cultivated foods; forest trees, plants, birds; ocean water, marine fish; coastal tidal zone, shellfish; and berries, mushrooms and edible plants. In the monitoring framework, all species are considered to be equally important and dependent on one another – so all species are monitored. (For example, within the freshwater realm of Tangaroa, 45 attributes of the river are monitored and recorded. A monthly programme is run based on the Ngati Hine moon calendar, which provides a timeframe for recording each attribute. Local guardians monitor their assigned areas at least once a month with the aid of tablets and a specific GIS software (GIS Cloud), testing the calendar and adding to it. They record data, monitor and control invasive species and coordinate enhancement work (e.g. 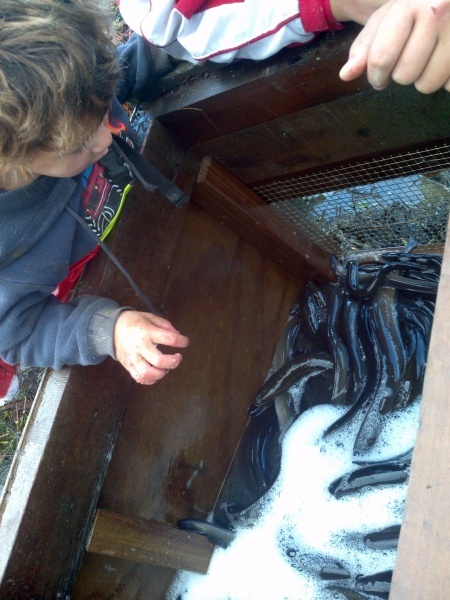 riparian planting or clearing obstructions for longfin eels, a significant species for the Ngati Hine who help the eels to swim past the waterfalls during their migrations)). The Ngati Hine put together databases on species of significance, focussing on those that are no longer sustainable for customary use as medicine or food. For example, in relation to the vulnerable kiwi bird, the Ngati Hine work to control pests and plants that are poisonous to kiwi and ensure it has enough food. Youth are actively involved as monitoring activities are used as a way to transfer and apply traditional knowledge on biodiversity. Information is uploaded into a database and further actions are discussed in joint meetings. The Indigenous Knowledge and Peoples Network (IKAP), a regional network of indigenous communities throughout Mainland Montane Southeast Asia, has as its primary goal the protection, promotion and enhancement of the practice of indigenous knowledge. The IKAP carried out research in three areas in Chiang Mai province where rotational farming is practiced. The research illustrated that rotational farming (or shifting cultivation) is a highly sophisticated agro-forestry practice where a selected patch of land is cleared and its vegetation dried and then carefully burned. Then the land is cultivated, and after harvesting left fallow for a long period (generally 7-10 years) to regenerate. All this is carried out based on a deep cultural and spiritual relationship between the people and the environment and in accordance with customary rules and regulations. Unfortunately, rotational farming is often misunderstood and blamed for forest fires, release of carbon into the atmosphere, and forest destruction. The community research addressed this issue. 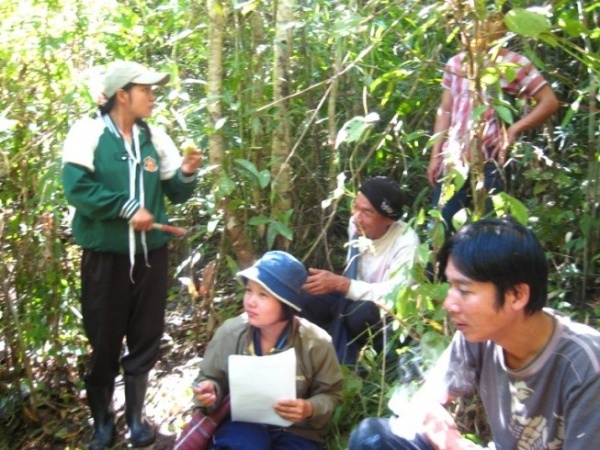 Community monitoring of Karen farming areas in Mae Lan Kham and Hin Lad Nai (Trakansuphakon 2015) using a stock-based approach to analyze above-ground carbon, showed that rotational farming stores much more carbon than it emits. The net carbon storage from fallow fields, covering 236 ha and left to recover for up to 10 years, accounts for 17,348 tons C, while CO2 emissions from the burning of fields amounts to only 480 tons C [See UNEP/CBD/WG8J/8/INF/11]. The research also documented a large number of edible plant species that grow (or are grown) in each successive year during the 7 to 10 year fallow period, all of which significantly contribute to food security and sustainable livelihoods, as well as diverse species of fauna that find food in and are attracted to the fallow plots. This community-based research and monitoring activity illustrates the positive contribution of rotational farming to people’s livelihoods, biodiversity, carbon storage and to the revitalization of traditional knowledge and cultural identity. It has also contributed to changing the perspectives of government and media and to the adoption of a Thai Government Cabinet Resolution for the Revitalization of the Karen Way of Life in 2010 and its subsequent implementation, thereby providing policy support for the maintenance and revitalization of a particularly important example of SEPLS in Northern Thailand. Tinoc is one of the pilot communities of the Philippine Traditional Knowledge Network (PTKN), where community-based monitoring of traditional knowledge is being conducted using multiple indicators including linguistic diversity, traditional occupations, land tenure and land use change. Data generated includes cultural mapping of multiple land and forests uses, documentation of customary tenure systems, traditional occupations, status of traditional knowledge holders and cultural transmission. Status of flora and fauna, productivity of major crops and soil fertility have also been investigated. Some findings include: contraction of watershed forests to 60% of their size in 1970 due to conversion to vegetable farming, and up to 30-50% decline in rice yields due to weakening of traditional knowledge on soil enhancement practices, as well as increased pest damage due to veering away from traditional pest control such as synchronized farming activities. shifts from chemical-input farming to ecological/sustainable farming. The information has been shared with local and national governments. It has led to the adoption of a covenant (by the local community and local government) to arrest environmental degradation and promote people’s well-being through the revival of indigenous knowledge practices and systems of territorial management. Drawing on pilots such as activities in Tinoc, the Philippine Traditional Knowledge Network (PTKN) and Tebtebba Foundation submitted a list of traditional occupations to the Philippine National Statistical Coordination Board (PNSCB) for consideration in the revision process of the Philippine Standard Classification of Occupations (PSOC). This resulted in the incorporation of some of the submitted traditional occupations. The PTKN also coordinated with the National Focal Point of the CBD on updating the National Biodiversity Strategy and Action Plan (NBSAP) and associated traditional knowledge indicators (TEBTEBBA 2013). The Wapichan people (composed of 17 communities) in Guyana, have successfully developed a community-based management plan (Forest Peoples Programme 2012) in 2012 for use and care of lands and natural resources in their territory (composed of a mosaic of forest and savannah habitats). They are now setting up an environmental monitoring programme to monitor environmental changes in the territory (forest cover, water quality, threatened species, land use, etc. ), and to inform traditional authorities about activities that are, or may be, harmful to the environment and the communities. This information is then used in dialogue with relevant government authorities, for instance in relation to proposed or existing mining and logging concessions. The information is also intended to support a Wapichan application for a collective land title over their customary territory, using photographic and geo-referenced evidence of traditional use. From 2013-14 a start was made with the training of two community monitoring teams, including customized design and testing of community monitoring forms (on smart phones), field monitoring trips, and trial use of an Unmanned Aerial Vehicle (UAV) to monitor extractive activities in remote areas of their territory. The Wapichan are currently developing a community-owned website which includes an interactive map with all mapping data and locations. This is expected to be made public after the pilot-testing. The development and implementation of the territorial management plan and the setting up of an environmental monitoring programme (including the choice of monitoring tools) have taken place through hundreds of intra- and inter-community meetings, workshops and agreements. While many challenges lay in front of them, the Wapichan are proudly looking forward to a sustainable future for their communities and landscape. Results of CBMIS are starting to be realized at the local, national and international level. At the local level, the primary aim of data collection and monitoring is to strengthen the local knowledge base for territorial resource management and community development. In this respect, local communities are using the data for their own strategies and to address their needs and aspirations. In all the cases above, the development of community-based research and monitoring activities has contributed to strengthening the institutional capacities of local communities and to developing concrete activities to protect and sustainably use their territories and resources. One of the most common tools used has been community mapping. Maps produced by the communities demonstrate their traditional occupations and customary use of resources in their territories and are often used as the basis of a territorial defence strategy. They are likewise used as a tool at the local and national levels to assert more secure land and resource rights and to support the communities in dialogue and negotiation processes with outsiders who want to access forests traditionally inhabited or used by them. For example, community maps have contributed to renegotiation of protected area management plans in Cameroon and Thailand, exposure and monitoring of illegal logging in Cameroon, and negotiation with mining and logging companies in Guyana, Suriname and Cameroon (Forest Peoples Programme 2011). In more recent years, they have also been used as the basis for territorial sustainable development planning, as illustrated by the Wapichan case in Guyana. Outcomes also include a better understanding and appreciation of indigenous practices (such as rotational farming, which is still the subject of much dialogue and debate), overcoming biases toward and incorrect assumptions about indigenous practices and land use patterns, and a better understanding of the sustainable nature of various customary practices by indigenous peoples and local communities – for instance subsistence hunting versus illegal poaching, hunting or fishing. Community-based documentation has demonstrated that indigenous areas (including SELPS) are not open-access areas, but regulated commons, based on collective ownership and use, and have their own effective ways of governance, management and monitoring, based on customary rules and laws. Some of the communities have been able to influence policy and legal reforms through the data and information produced. As illustrated in the second case study, in Thailand, for example, work on the relationship between cultural identity and customary natural resource use (particularly rotational farming) has contributed to the adoption by the Thai Cabinet of a Resolution for the Revitalization of Karen Way of Life in 2010 and for consistent implementation of the resolution. In the Philippines, as a result of monitoring work at the local level, the Philippine Traditional Knowledge Network (PTKN) and Tebtebba Foundation became involved in review and revision of the National Biodiversity Strategy and Action Plan. Community efforts have resulted in greater appreciation and support also at the international level, to date particularly related to the CBD and IPBES. A Decision at the COP12 meeting (October 2014) welcomed the initiatives and contributions from the CBMIS network [For instance Decision XII/12, para 6: “Welcomes the work carried out under the Working Group on Indicators of the International Indigenous Forum on Biodiversity and other international organizations, in particular the Community-Based Monitoring and Information System approach, to operationalize the indicators on the status of traditional knowledge, innovations and practices and customary sustainable use of biological diversity, to assess progress towards implementing the Strategic Plan for Biodiversity 2011-2020 and achieving the Aichi Biodiversity Targets”], and the 8th Meeting of the Working Group on Article 8(j) and Related Provisions referred to CBMIS as “a significant initiative to complement data being generated through national reports and through other means about the implementation of the CBD Strategic Plan” [See Document UNEP/CBD/WG8J/8/L.2 (Progress report on the implementation of the programme of work for Article 8(j) and related provisions and mechanisms to promote the effective participation of indigenous and local communities in the work of the Convention)]. Parties at SBSTTA-17 also noted that “citizen and community based initiatives have an important and growing role to play in helping deliver in-situ monitoring”. It was likewise noted that “local knowledge and monitoring efforts are often a critical source of information, complementing scientific approaches and frequently covering different temporal and spatial scales. Respect, trust, equity and transparency are essential for enabling monitoring that draws on combinations of indigenous, traditional and scientific knowledge systems” [UNEP/CBD/COP/12/2 (SBSTTA17 report), annex 1]. The 4th Global Biodiversity Outlook (GBO-4, October 2014) complete report, executive summary, and technical background papers included a number of CBMIS case studies and information based on community-based research and materials, and suggested actions in support of community-level initiatives and contributions. At COP12, the CBD also took a very important step in recognising and supporting customary sustainable practices of indigenous peoples and local communities by adopting a Plan of Action on Customary Sustainable Use [Decision XII.12, pages 3-10]. Emphasis will now be on implementation of the plan and CBMIS can certainly play a role in both implementing the plan and monitoring progress up to 2020 and beyond. The IPBES process is another example of a global assessment process that has embraced CBMIS to balance the conventional science bias. The IPBES has formed a Task Force on Indigenous and Local Knowledge to develop and test approaches and procedures for working with different knowledge systems, although the task force is still in the initial stages of work. Monitoring activities by communities at the local level have taken place for a long time. However, the recent focus on CBMIS has helped heighten the role that community monitoring can play at the local, national and international level. At the local level, CBMIS is likely to be used by indigenous peoples and local communities to monitor and take action on issues identified by them as important and relevant. At the national level, CBMIS can contribute to national monitoring, assessments and reporting related to any relevant process (e.g. NBSAPs and implementation of the UN Declaration on the Rights of Indigenous Peoples). At the international level, while so far CBMIS has been acknowledged and recognized in the CBD and IPBES, there is clearly a natural potential for expansion to other SEPLS-relevant processes. This year the UN General Assembly will agree on a global transformative agenda on sustainable development with the vision of “leaving no one behind.” Equally important to the post-2015 sustainable development plan will be the monitoring and accountability mechanisms being established to benchmark progress and inform further action for implementation. To date, efforts have focused on the UN Statistical Commission and government actions to monitor progress, but the “Data Revolution” concept [See http://www.undatarevolution.org] promoted by Secretary General Ban Ki-Moon raises the potential for widespread citizen involvement in this crucial activity, with tools being available for widespread data generation, management and use. Likewise, in December 2015, the UN Framework Convention on Climate Change is expected to adopt binding commitments on climate change mitigation and adaptation. The CBMIS network already includes communities working on climate mitigation; therefore, CBMIS could be well poised to contribute to monitoring the implementation of post-2015 climate commitments. While these are possible options, they would require support for CBMIS as a complementary method to national statistics and global monitoring systems, as well as collaboration with relevant research institutions. Another challenge is the concern on the part of community organizations already engaged in community-based monitoring initiatives regarding the potential for a steep increase in the demands/requests placed on indigenous and local community networks or groups, many of which are struggling to find funding or support for their local-level work. The priority from the community’s point of view is resource mobilization to continue and carry out their monitoring and data-gathering work. Many communities face daily threats and are in need of increased financial and technical assistance. In this regard, it should be noted that technical assistance for CBMIS can take various forms and shapes. In some cases, indigenous peoples or local communities develop technical capacity internally and only rely on very specific and limited advice from outside (e.g. case study 1). In other cases, support from, and collaboration with, indigenous organizations operating at the national or subnational level (e.g. case study 3) or national or international NGOs (e.g. case studies 2 and 4), is involved. However, it is most important that the indigenous people or local community retain control over decision-making and the outputs of the CBMIS process. While monitoring activities by communities at the local level have taken place for a long time, the recent initiative of a network of indigenous peoples and local communities to focus on CBMIS is heightening the role that community monitoring can play at local, national and international levels. The case studies demonstrate how CBMIS can be used to take stock of resources on the ground and of community well-being, to protect communities and the resources on which they depend from unwanted external pressures and potentially unsustainable activities, to support communities in developing, implementing and monitoring their own territorial management plans, and to contribute data and information to national environmental and development processes, thereby participating more effectively in them. CBMIS is also emerging as a useful toolkit in monitoring implementation of international commitments and national targets. While the CBD and IPBES have already taken significant steps to acknowledge and support CBMIS, there is clearly a natural potential for expansion to other SEPLS-relevant processes, such as the post-2015 Sustainable Development Goals and the climate change commitments expected to be agreed upon in December 2015. While a number of challenges are emerging, CBMIS initiatives have the potential to become important complementary data sources for global, regional and national assessments relevant to biodiversity, climate and sustainable development and for monitoring implementation of international processes and agreements. Most important of all, however, is that CBMIS tools should remain controlled by, and useful to, indigenous peoples and local communities on the ground in their daily lives. Finn Danielsen et al., (2013), Linking public participation in scientific research to the indicators and needs of international environmental agreements (Conservation Letters 00 (2013), 1–13.